Mass transit is not a new idea in Tucson, Arizona. In 1906, electric streetcars replaced horse-drawn cars. In 1993, the Old Pueblo Trolley heritage streetcars cruised the streets and ran until 2011. Modern day, the city makes way for the new Sun Link streetcar system, but more than just the transportation units themselves received the upgrades. The electric streetcar replaces old transit systems, and at the 7th and 8th Street Station, playful cacti greet people along their busy commute. The artwork installed along the new stop at North Fourth Avenue continues the natural yet energetic evolution of the transit system in Tucson. With a collaboration of efforts from concrete installer, Colorado Hardscapes’ Arizona office, known locally as Progressive Hardscapes, and the artist, Mary Lucking, beautiful art graces the busy city in an unexpected place: at their feet. Generally, city policy does not spark creative minds, but merging city policy with the ambiance of North Fourth Avenue ignited a new kind of energy. A vibrant arts scene, eclectic dwellings, markets, bookstores, cafes, bars, gift shops and vintage architecture help create a unique character along North Fourth Avenue, making it an epicenter for art and culture in Tucson. 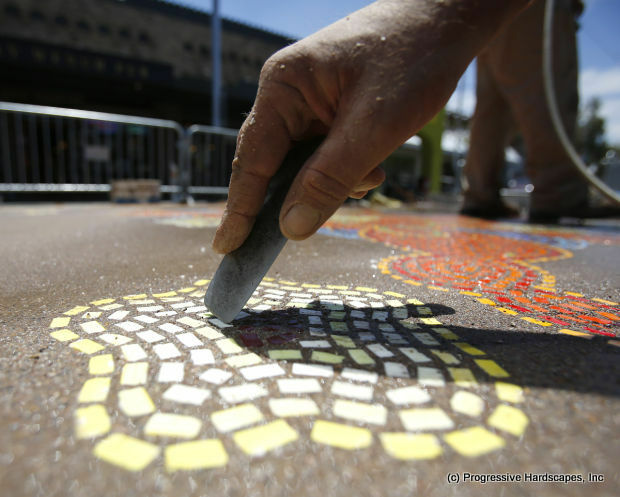 According to the local paper, Arizona Daily Star, “The streetcar art project stems from the city’s policy of spending 1 percent of construction costs for public art.” At the new streetcar stop along North Fourth Avenue, artist Mary Lucking visually displays beautiful cactus artwork in the concrete flatwork. The energetic and colorful nature of the avenue inspired Mary Lucking, and her collaborator, Pete Goldlust’s cacti designs. Goldlust’s designs will keep passengers company aboard the streetcars on the seatbacks, while Lucking’s design emerges out of the streetcars onto the every day hustle and bustle of the street. Despite the quick set time of concrete, this concrete art piece did not happen overnight. It started small, with sampling of materials, textures and colors. Once the artist and Hardscapes fine-tuned the possibilities of the LithoMosaic® medium through sampling, the artist took what she learned back to her studio. There, she spent about 200 hours exquisitely placing approximately 28,056 glass mosaic tiles before she handed the blankets of artistic mosaic designs over to Hardscapes’ Arizona crew. In contrast to the lengthy in-studio time, the on-site installation only took 3 days. The process preserves care and craft of the art form while not impeding on the hectic schedule of transit oriented development. Great care and detail went into the installation of the tiles and the finishing of the final surface. There is no room for error in an installation like this. At the end, the city, the artist, the Tucson commuters and Hardscapes embrace this new stop along North Fourth Avenue as part of the vibrant character of the evolving Tucson. The new stop at the 7th and 8th Street Station, emulates the energetic atmosphere of the cultural epicenter, and embraces the respect and passion for hard work, teamwork, and hand-crafted perfection.